Winter Patriot: Back From The Brink: No State Of Emergency In Pakistan -- Yet! Back From The Brink: No State Of Emergency In Pakistan -- Yet! Pakistan's President, General Pervez Musharraf, has decided not to declare a state of emergency after all -- at least for the moment. The decision was apparently influenced by a 2AM phone call from Condoleeza Rice. Nobody wants to say what they talked about, but considering the timing of the call, the subject matter seems just a tad obvious. One Pakistani official said that Ms. Rice exhorted General Musharraf not to declare emergency rule. “She thought it was an opportune moment to talk about a couple of things,” Mr. McCormack said without elaborating. I always find 2AM an opportune moment to talk, don't you? "In the president's view, there is no need at present to impose an emergency," Information Minister Mohammad Ali Durrani said. "The president was under pressure from different political parties to impose an emergency, but he believes in holding free and fair election and is not in favour of any step that hinders it," Durrani added, without specifying which parties. President Bush echoed (or foreshadowed) Musharraf's desire to see a "free and fair election". Bush said Americans must recognize that Pakistan "is a sovereign nation." 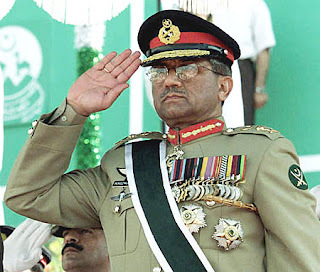 As for Pakistan's domestic scene, his focus "is that he [Musharraf] have a free and fair election," Bush said. "And that's what we have been talking to him about. I'm hopeful they will." Unfortunately, we all know what it means when Bush talks about a "free and fair election". Like a football manager declaring that he had the full confidence of the club chairman, President Pervez Musharraf's announcement that he was committed to holding free and fair elections in Pakistan was not so much meaningless as ominous. Ominous indeed. As always, I'll be keeping a cold eye on Pakistan as it continues to heat up.